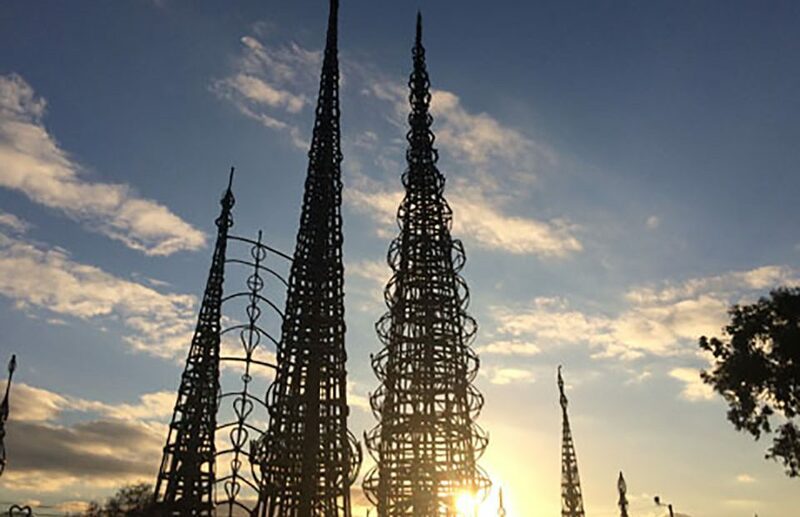 René, Minal and I make a trek to Watts, one of LA’s oldest neighborhoods, where we manage to catch sunset at Watts Towers (Simon Rodia, the artist who created the structure, called the work “Nuestro Pueblo”). Though the towers are lower than they appear in photographs, I’m still stunned by how one man – using found objects (glass, bottle-tops, steel, scrap metal etc.) – created these structures over a span of thirty years. Rodia’s house no longer exists but one of the arches (see photo below) marks what was once the entrance to his home. Though I’m generally drawn to art that has direct relationship to social justice issues – such as Tropical America (1932) by David Alfaro Siqueiros that I experience thanks to my friend writer Veronica Reyes – I still appreciate the creation Rodia’s installation. 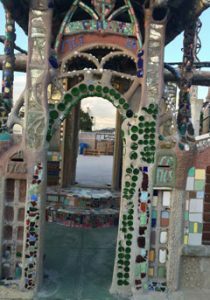 As we peer at the mosaic through the fences, I’m reminded of Houston’s Orange Show and the Beer Can House.